This new Town Hall did not have a town council as such. Sheffield was late to becoming an independent Borough. It was not until 1843 that a Borough Council was formed and not till 1866 that they took over the old town hall. 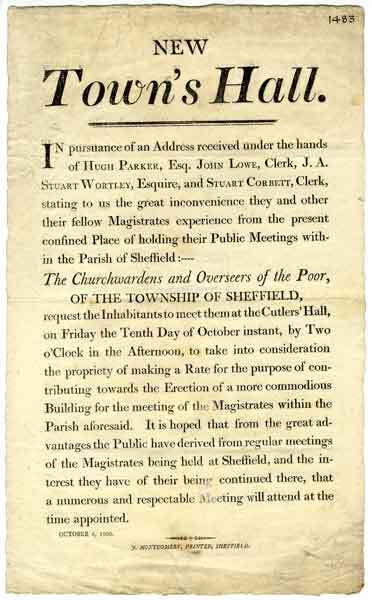 Before 1843 Sheffield’s administration was largely in the hands of three self-perpetuating bodies: the Town Trustees, the Church Burgesses, and the Company of Cutlers in Hallamshire. 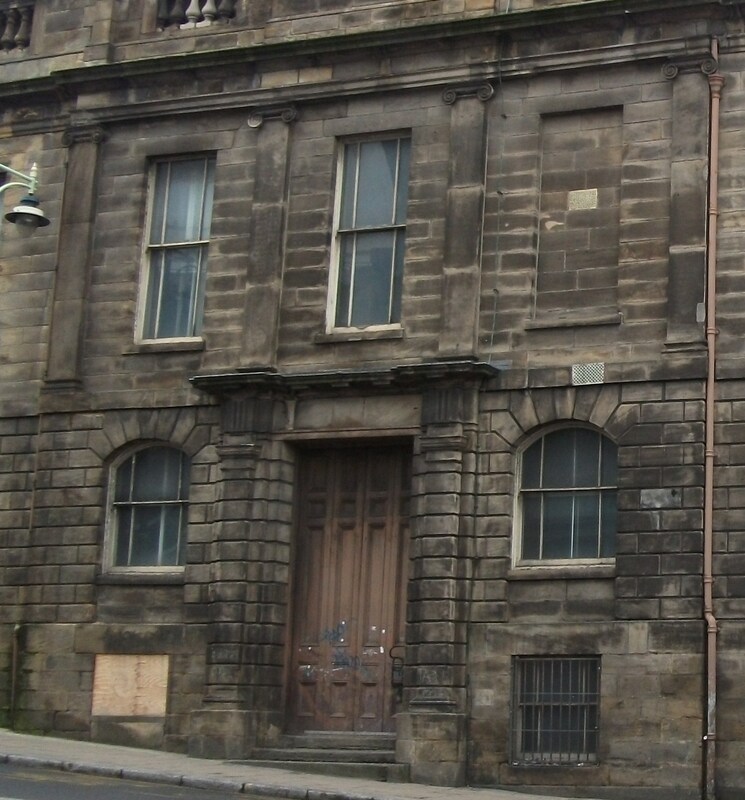 The Cutlers’ Company dates from 1624; its original responsibility was the organization of the local cutlery trades. The Church Burgesses date from 1554, although they share a common ancestry with the Town Trustees, whose charter, 10 August 1297, makes it one of the oldest charities in England. 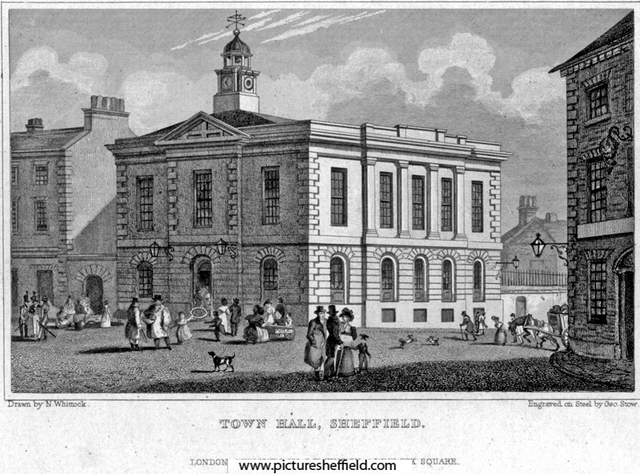 The history of the Sheffield police force can be said to date from 1818 when, after considerable debate, an Improvement Act was passed which transferred the lighting, watching and cleansing of Sheffield from the Town Trustees to a body of Commissioners. Colonel Fenton was appointed as first superintendent of the police and on his death in 1835 he was succeeded by Thomas Raynor. In 1836 the first day policemen were appointed. On 4 April 1844 responsibility for the police force was transferred from the Improvement Commissioners to Sheffield Town Council, under the supervision of the Watch Committee, and in June that year the area covered was extended outwards from the centre of the town. At first the force was housed in the Town Hall and it was not until 1864-1865 that a police station was built in Castle Green. So it can be said that both the Sheffield Council and the Police Force have their birth within this building. 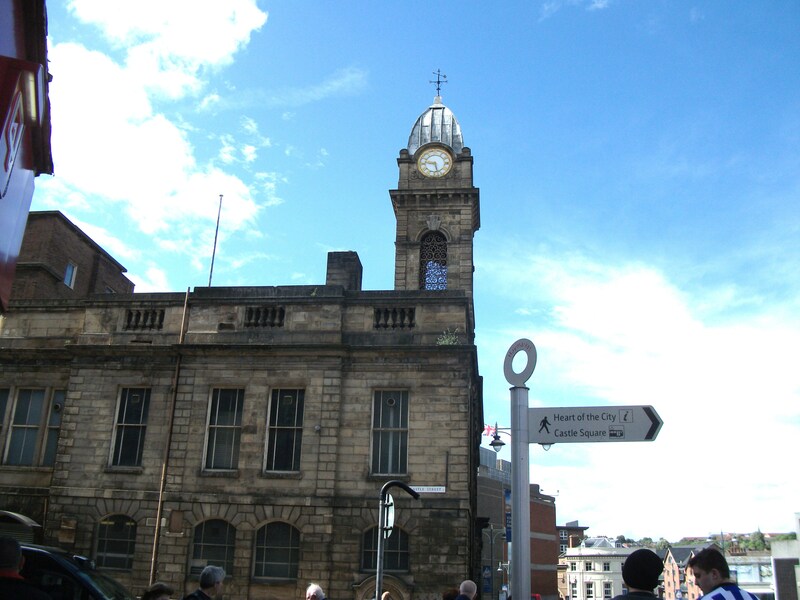 There are other important links with Sheffield’s past In 1840 the Chartists plotted to take over the Town Hall but ironically ended up in its cells. In 1867 a Royal Commission met there enquiring into what was known as the Outrages. Essentially it was a period of extreme violence between Manufacturers and Trade Unions. It was as a result of this enquiry that regulations and laws were laid down making trade unionism legal and giving workers the right to sue their master for breach of contract. So it was here that legal Trade Unions originated. The building itself tells the expansion of the city with an extension in 1833, then in 1866 when the Borough Council moved in, and in a matter of years to again to be too small for the Councils purposes and became the Court house only, with its final demise as a public building when new courts were built down the hill. This was the beginning of years of neglect.